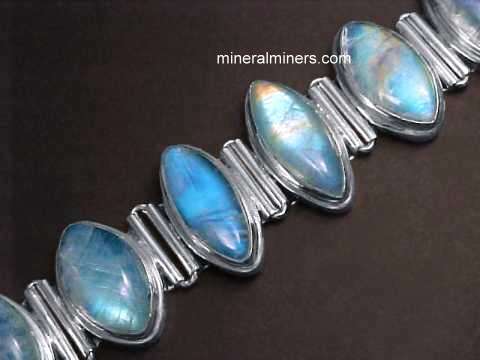 This page will take a little longer to load since it contains all of our on-line selections of natural gemstone bead bracelets for all minerals. NOTE: If the images on this page do not load properly (or if they take too long to load! ), then you should visit our Alphabetical Jewelry Index where there are links to separate pages for each mineral variety, the images of our jewelry items on these specific mineral variety pages will load much faster. Select any natural gemstone bead bracelet image to enlarge it. These natural almandine red garnet bracelets were handcrafted from natural color deep red garnet crystals that were mined in Brazil. These semi-transparent red garnets were hand-ground into rounded shapes and then polished, drilled, and strung on an elastic band into these natural red garnet bracelets. See also a close-up view of one of these natural red garnet bead bracelets held to a light. When viewed under sunlight, some of the beads in each of these natural red garnet bracelets show natural 4-ray or 6-ray stars! Each bracelet has 160 carats of natural red garnet beads. Natural color unheated and untreated aquamarine pieces with beautiful greenish-blue color were hand-ground into rounded shapes and polished into translucent to semi-transparent beads which were then drilled and strung into these genuine aquamarine bracelets with an elastic band fitting wrist sizes up to size 8. We have these beautiful aquamarine bracelets available in several bead diameter sizes. Please see below to order. 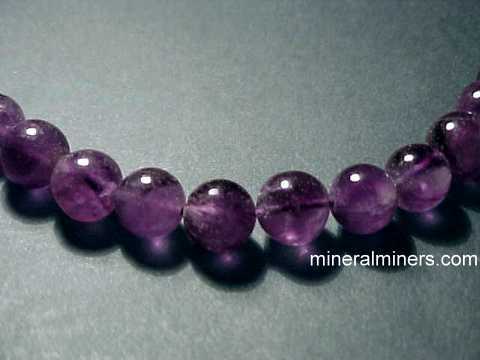 Each bracelet contains over 300 carats of natural amethyst beads! These wonderful garnet crystal bracelets are strung with natural terminated red garnet crystals! Most of the garnet crystals are in very good condition and are completely covered with natural terminations, and a few of the crystals have some broken surfaces. 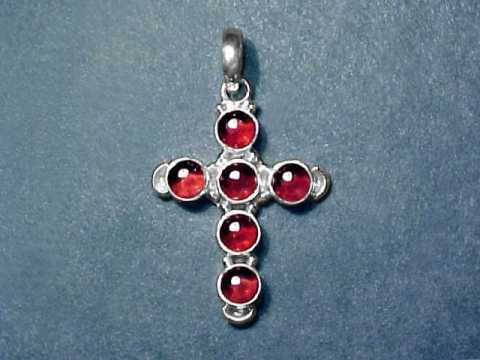 These semi-transparent red garnet crystals have completely natural deep red color. They were drilled and strung on an elastic band in this genuine garnet crystal bracelet fitting wrist sizes up to size 7. See also a close-up view of one of these garnet crystal bracelets held to a light. We have these beautiful almandine garnet bracelets available in two approximate crystal sizes: with 8mm to 9mm long garnet crystals, and a rare extra large size with 10mm long garnet crystals. Please see below to order. The beads in this genuine jade bracelet were ground and polished from completely natural nephrite jade that was mined in Canada. 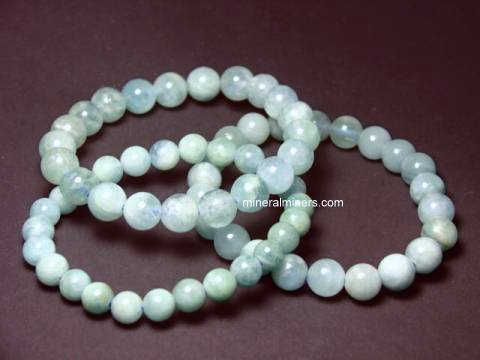 These natural color jade beads are unheated and untreated. They are strung on an elastic band that fits all wrists sizes up to a size 8. The beads in these natural jade bracelets were hand-ground and polished into 8mm round shaped beads from 100% natural nephrite jade that was mined in Canada. They are unheated and untreated natural nephrite jade. These genuine jade beads are strung on an elastic band that fits all wrists sizes up to a size 8. These genuine tourmaline bead bracelets are strung with natural tourmaline beads on an elastic band fitting all wrist sizes up to size 7 1/2. Most of these genuine tourmaline beads are so dark that they are actually black tourmalines, while a few are a very dark green or dark brown. These are all untreated natural color tourmaline beads with no dyes, no fillers, and no epoxies! 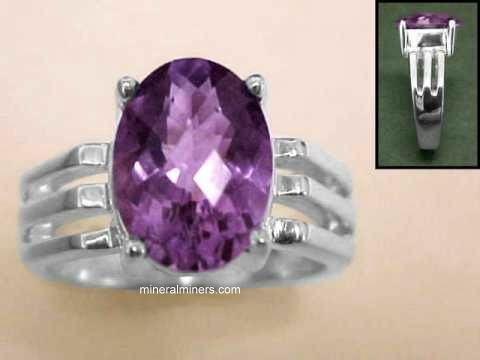 They are 100% natural tourmaline beads, and when examined closely they show natural pits & cracks. See a close-up photo of these black tourmaline beads with occasional flat spots on their surfaces, and there are occasional small inclusions of other minerals within the tourmaline. The beads in these genuine tourmaline bracelets were hand-ground & polished from natural tourmalines mined in Brazil. We have these genuine tourmaline bead bracelets available in two approximate bead diameter sizes, please see below to order. You can also see our entire inventory of Gemstone Bead Bracelets, available in a wide variety of natural gem materials. Item tmcj218a: has 100 carats of natural tourmaline beads on elastic interwoven bands fitting all wrist sizes from size 6 1/2 up to size 7 1/2. These natural tigers eye bracelets were handcrafted from natural color tigers eye rough mined in Africa. 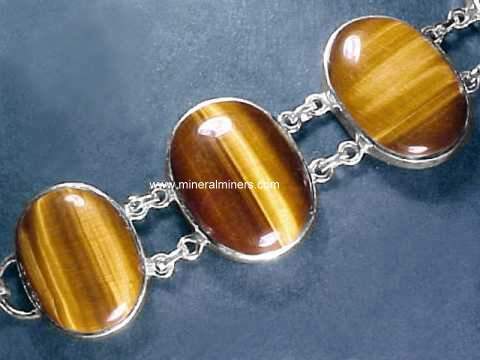 The golden-brown tigers eye was hand-ground into rounded shapes and then polished, drilled, and strung on an elastic band into these genuine tigers eye bracelets fitting wrist sizes up to 8 inches. We have these beautiful bead bracelets of genuine tigers eye available with 14mm long beads. Please see below to order. These fine tigers eye bracelets have six extra large size beads of natural golden brown tigers eye! Each of these genuine tigers eye beads measures 1.2 inches long x 0.8 inches wide (30mm long)! They were drilled and strung on elastic bands fitting all wrist sizes up to a size 8. Gem quality pieces of natural amethyst averaging 1/2 inch long (12mm) with rich purple natural color were tumbled & polished in baroque shapes, and then drilled and strung in this genuine amethyst bracelet on an elastic band fitting all wrist sizes up to a size 8. The beads in this natural amethyst bracelet have very fine transparency ranging from lightly included to eye clean, and they have not been heated or treated in any way! This beautiful amethyst bracelet has tumble polished natural amethyst pieces with light to dark purple natural color (these genuine amethyst beads are completely natural - they have not been heated or treated in any way). 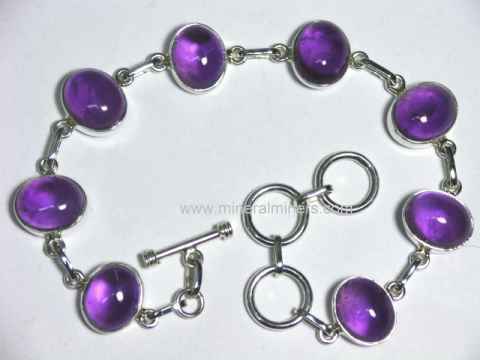 The beads in this natural amethyst bracelet were drilled and strung on an elastic band fitting all wrist sizes up to size 8. 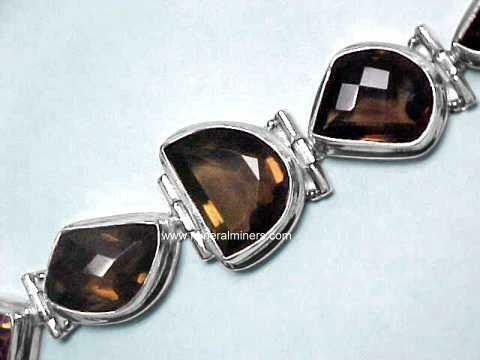 This beautiful citrine bracelet has tumble polished citrine beads with light golden to rich dark golden color. These lightly included beads were drilled and strung in this citrine bracelet on an elastic band fitting all wrist sizes up to size 8. This citrine bracelet has transparent pieces of citrine averaging 0.4 inches long (10mm) with rich golden citrine color. They were tumbled & polished in baroque shapes, and then drilled and strung on an elastic band in this beautiful citrine bracelet fitting all wrist sizes up to a size 8. 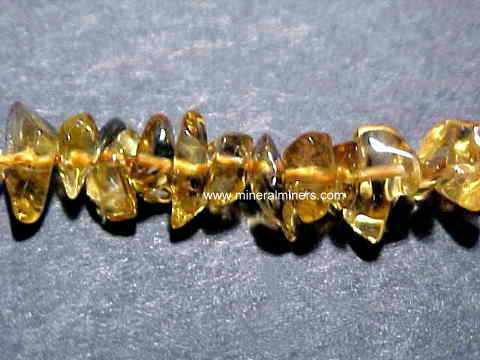 These citrine beads have superior transparency ranging from slightly cloudy to eye clean. 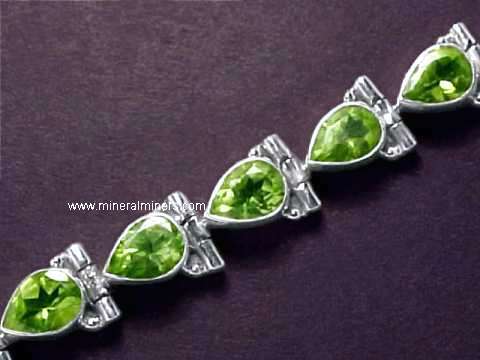 This genuine peridot bracelet has tumble polished peridot pieces with beautiful green natural color. These lightly included peridot beads were drilled and strung on an elastic band. This natural peridot bead bracelet fits all wrist sizes up to size 8. Gem quality pieces of natural flourite averaging almost 1/2 inch long (11mm average) with beautiful shades of green, blue-green and purple natural colors were tumbled & polished in baroque shapes, and then drilled and strung on an elastic band fitting all wrist sizes up to a size 8. These natural fluorite beads have very fine transparency ranging from lightly included to eye clean, and they have not been heated or treated in any way! The beads in this wonderful kyanite bracelet were ground and polished from natural kyanite crystals that were mined in India! These kyanite beads are translucent to semi-transparent, and they have lovely blue natural color. They were hand-ground and polished into different shaped beads which were then drilled and strung on an elastic band that fits comfortably on all wrist sizes up to 7.5 inches. The photo at left was taken under incandescent light, see also a top-view photo of this genuine blue kyanite bracelet. Natural colorless rock crystal quartz pieces averaging 1/2 inch long with superior transparency were tumbled & polished in baroque shapes, and then drilled and strung in this beautiful quartz crystal bracelet fitting all wrist sizes up to a size 8. These natural quartz crystal beads have superior transparency ranging from faintly included to internally flawless, and they have not been heated or treated in any way! This extra wide apatite bead bracelet measures over 1.5" wide! 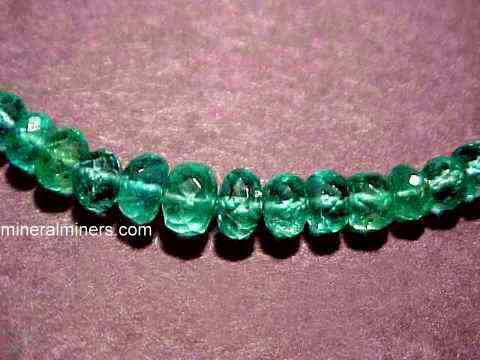 It has 375 carats of transparent polished apatite pieces with very rich greenish-blue natural color as shown. These beautiful beads are lightly included to eye clean! They were drilled and strung on an interwoven elastic band fitting all wrist sizes up to 8 inches. This extra wide lace agate bead bracelet measures 1.75 wide. It has over 400 carats of translucent polished lace agate pieces with pale blue-grey natural color as shown. They were drilled and strung on an interwoven elastic band fitting all wrist sizes up to 8 inches. This beautiful power bead bracelet was made from natural hematite rough mined in Brazil. It has side-by-side strung 6mm round magnetic hematite beads alternating with 16mm half-cylinder magnetic hematite beads; a very stylish combination! They are strung on an elastic band that fits all wrist sizes up to 8 inches. Our Gemstone Bead Bracelets are all natural gem materials! Would you like us to inform you when we add on this page more natural gemstone bead bracelets? We do have a large inventory of natural gemstone bead bracelets in stock, so be sure to let us know if you have any special requests. We have been mining for aquamarine, amethyst, topaz, garnet, tourmaline & other gems for more than 25 years. We have a large variety of natural gemstone bracelets available with many different kinds of natural gemstones including genuine amethyst bracelets and peridot bracelets in a wide variety of sizes and shapes, and we have citrine bracelets in both golden citrine & lemon citrine. We also have in stock natural color genuine jade bracelets including natural cats eye jade bracelets! See our natural gemstone bead bracelets page, and our natural jasper bracelets, our natural green aventurine bracelets & lapis lazuli bracelets. We have a selection of genuine red garnet bracelets and other red garnet jewelry as well. We also have genuine larimar bracelets and genuine meteorite bracelets! Our natural color aquamarine bracelets are available with many different aquamarine gemstone shapes and sizes to choose from. 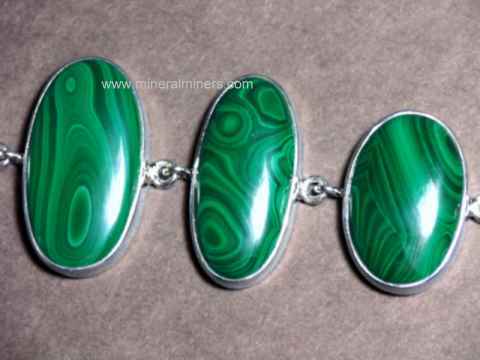 We also have pages displaying natural color malachite bracelets and genuine smoky quartz bracelets. We have a large selection as well of genuine sky blue topaz bracelets. 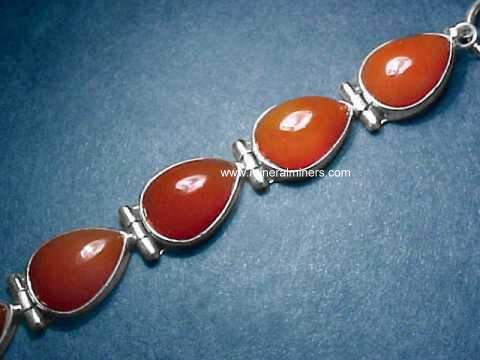 Be sure to see our natural gemstone jewelry pages displaying several different varieties of agate bracelets in pure sterling silver including genuine carnelian bracelets. 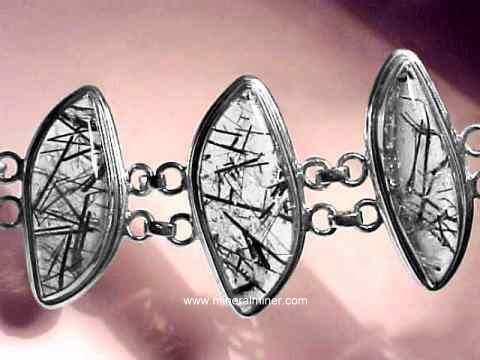 We also have genuine moldavite bracelets, amd genuine fossil bracelets, all set with 100% natural gemstones. Be sure to also see our genuine peridot bracelets and our extra large size tanzanite bracelets set with large rough chunks of genuine tanzanite. 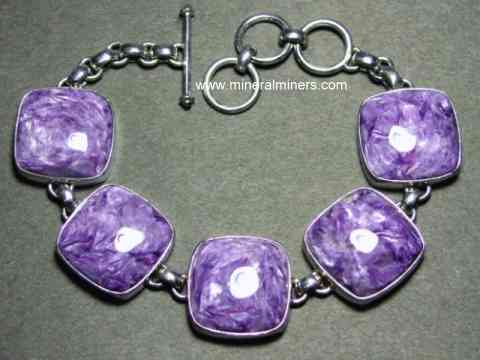 See the links below for a selection of superior quality genuine gemstone bracelets.